Title : Vue de l'Ile de Ste. Helène prise à proximité du Fort St. James. Date : Vienna, c. 1820. Size : 14.2 x 17.9 inches. / 36.0 x 45.4 cm. 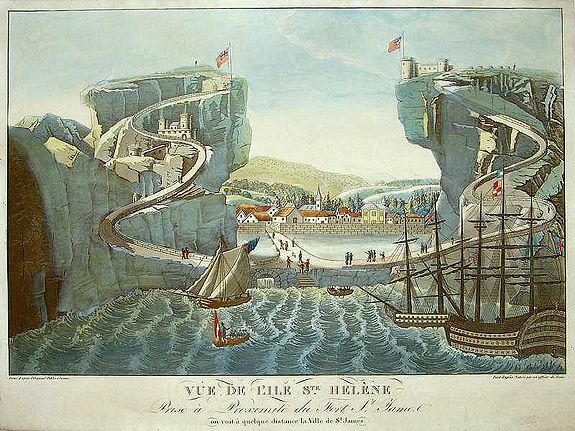 Description :Rare view of St. Helen's Island Jamestown is a seaport and the capital of St Helena. The town was founded in 1659, when the English East India Company built a fort and established a garrison at the site on James Bay, naming it after the Duke of York (later James II) In 1815 the British government selected Saint Helena as the place of detention of Napoleon I of France. He was brought to the island in October 1815 and lodged at Longwood, where he died in May 1821. Condition : small tear in the upper right and lower left margin, both affecting 4mm of the image.